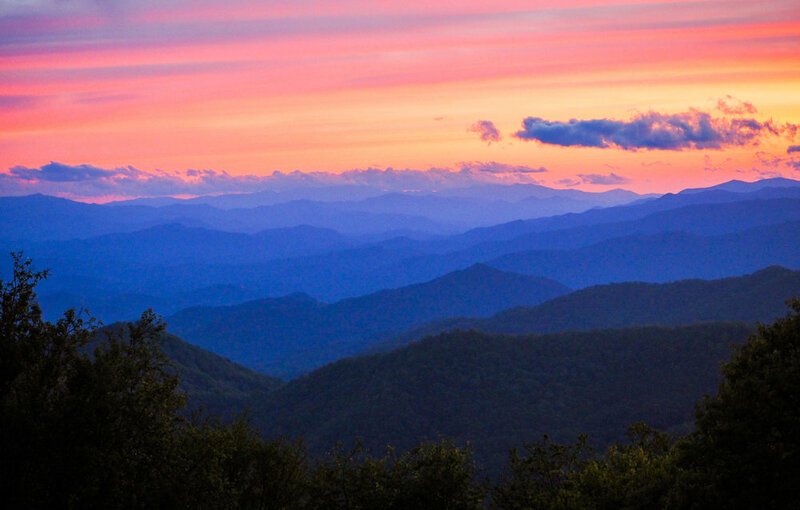 When you think of the Great Smokey Mountains National Park you probably think of an endless sea of mountains, picturesque sunsets, insane humidity and streams that run cold and clear. This is all true, and for people who don't want to hike 20, or even 10 miles into the backcountry to find all of those Instagram worthy views, the Smokey Mountains are for you. Today, I'm looking at the Smokies from a car camping perspective. With infinite opportunities to park your car and sleep for the night, these pull-offs offer a lot of bang for their buck and even allow a sense of adventure without stepping foot on trail. Let's start out with the obvious elephant in the room, Clingman's Dome. Towering in at 6,643 feet with 4500 feet of prominence, it is the third tallest peak in eastern North America. It is also the tallest peak on the eastern United States you can drive to. What does this mean? Endless views right out the car window. The drive to Newfound Gap, where the turn off to Clingman's Dome is, winds 18 miles from Gatlinburg. From there, the drive is another 7 mountain miles to the summit of Clingman's Dome. Be careful upon arrival, there might be wildlife running about, kids running rampant and clouds hitting you in the face. For an upgraded experience, put the windows down on your drive up there and breathe in all that fresh mountain air. Upon arrival to the parking lot at Clingman's dome, there are port-a-johns and trashcans for your use. Please keep the mountain clean. Views from the parking lot are phenomenal, however, if you want to stretch your legs there is a paved path up to the top of the viewing tower for views even more expansive. This "hike" should be easy enough for even the most out of shape humans. Car camping here is a good choice, with bathrooms, trash facilities and expansive views you can't go wrong. Be prepared for the elements as it will get much colder and windier as the night progresses because, after all, you are at 6,400 feet. The overnight population will dwindle to only the most serious of car campers during the overnight hours so you won't have too much company if you're looking for solitude. Last Thoughts: Easy access, great amenities, and low nighttime crowds make this a gem for getting a good nights sleep. Another great option for car camping is Newfound Gap. Newfound gap is the gap to which you climb if you're going from Gatlinburg to Cherokee or vice versa. This is the halfway point and right on the North Carolina/ Tennessee State line. Newfound Gap is full of amenities as well, sporting pit toilets and trash receptacles. There is a nice concrete walkway where you can perch a chair and watch the cars drive through the mountains at night. Just make sure to get up for the sunrise because, depending on the time of year, you will have a great vantage point. Personally, I think the sunrise view is probably only a 7/10 view. I haven't been there for sunset, but I think that view is also mediocre for what you can find in the smokies. The gap is a trailhead for Mt LeConte and Charlie's Bunion, as well as a plethora of other trails. The Appalachian trail passes right through the gap as well before heading up to Mount Kephart. Expect this parking lot to fill up and have multiple car camping parties especially in peak seasons. Park closer the the woods for a quieter night's sleep as the cars coming up over the mountain from Gatlinburg will produce a fair amount of noise and have their headlights beaming into your car throughout the night. Overall, a solid option with good amenities. Last Thoughts: Easy access, great amenities, key trailhead location, but a lot of traffic. Look for this spot if you're arriving late at night. The pull off just below Newfound Gap to the North Carolina side is a sleeper of a pull off. There aren't any toilets or trash cans, but if you're looking for a more quiet place to spend the night and catch an incredible sunrise this is the spot. Again, you'll need to see where the sun is rising for the time of year, but it rises over a plethora of mountains catching the sun's rays across the mountaintops as it rises. There won't be as many people here watching the sunrise as at Newfound Gap, however, the road runs right through the overlook so depending on traffic, it could be a bit noisier. Last Thoughts: Easy access, Less popular, and great sunrise views. This backs up to the woods too, so you could probably walk into the woods and hang up a hammock out of sight. The Blue Ridge Parkway is home to a plethora of overlooks and pull offs. Depending on the time of year and the day of the week there could be lots of traffic or very little traffic, it just depends. However, at night, it has been my experience people opt for hotels or campsites down in town rather than car camping up high on the mountain. With so many overlooks it's hard to write a description on all of them but when you find a good one you'll get that feeling you just need to stay. Most overlooks over few amenities. Some have trash cans and picnic tables others are just pull offs. The best way to find a good pull off is to search during the daytime and make note of the direction and vantage point of the view to come back when the sun is setting. I recommend getting a map if you want to further pinpoint pull offs. But for a better experience, leave it up to chance and have an adventure. Last Thoughts: The Blue Ridge Parkway offers AMAZING pull offs if you're willing to hunt for them. Look for something facing east or west depending what you want to see. It does take more time and more exploration to look for a good spot. For this location you should most definitely have a map. There is a good chance there is no cell service here and you're way out (5-10ish miles) from the nearest town. All wheel drive is good to have when exploring the back roads. Some of these roads lead up to gaps where you can camp off the road and hop right on a trail. There are numerous creeks to get water, bathe, fish, or just play in. Make sure you follow the LNT principles for getting rid of your waste and going to the bathroom, because you will be out in the wilderness. Be sure to bear proof your "campsite" and don't leave any food outside of your car. There are bears in the wilderness and they will eat your food and break through whatever they have to do to get it. Also, be on the lookout for Elk, they are huge and will hurt you, do not approach them. Crowded: You'll be lucky to see a soul. Last Thoughts: This spot is about the adventure and the secluded nature of being in the woods. There are numerous dirt roads in the park to be explored. Pull off and spend a night listening to the crickets, and with any luck you might see some wildlife walking by. The smokies are full of adventure. You don't have to hike miles to find a secluded spot to camp for the night, just a will to drive a little farther. There are unlimited pull-offs with expansive views, take it slow and stop at them, because you never know what you might see. As with all your outdoor adventures, make sure you leave the place better than you found it, so other people can enjoy this wilderness for years to come. You can check out some pins I've dropped over on my maps page! Get out and explore and let me know what you find!